We are Authorized Siemens Dealer, Distributor and Automation Partner in Pune (Maharashtra, India) Programmable logic controller (PLC) control panels or also known as PLC Automation Panel are one of the most important and efficient kinds of control panels. Which are generally used in variety of electronic and electrical circuit fittings. PLC Control Panels we manufacture are highly capable of giving higher output at less power consumption. Integrated with solid PLC logic and flawless PLC hardware programming. Control panel consist of a controller. Controller may be PLC, DCS, relay or some other type. It gives digital signal input signal to the MCC panel to start the motor. Control panel works based on the PLC /DCS program or the relay logic. Instruments are normally connected to control panel. Indications for the interlocks also will be there in control panel. Nowadays single panel is used of using separate control and MCC panel. Ease in modification of logic, reduced size, means of remote communications and advances in the technology have made PLC Automation Control Panels an edge over conventional relay based systems. Control Systems Engineers has provided PLC based Panels from PLC of Allen Bradley, Siemens, Modicon, GE Fanuc. From small I/O application to the complex I/O systems are provided by the Control Systems Engineers. Control Systems Engineers have developed communication software's for remote communication of the PLC Panels in various different protocols. 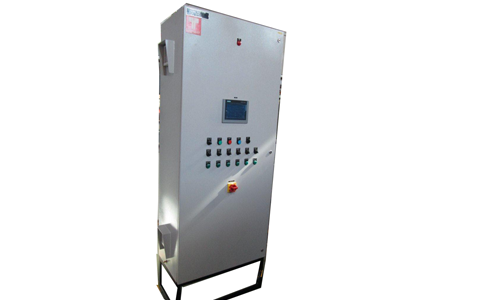 With PLC based Panels HMI/MMI are provided to provide the operator various messages and controls of the process plants touch screen MMI are provided. To effective control of the system. PCC Panels are the most essential part of electrical system of an industry from where the power of the industry is controlled. Perfect Products (India) is widely known for premium quality PCC panels designed and manufactured according to the customer specifications. Best quality switchgear and busbar are used for reliable and efficient performance. 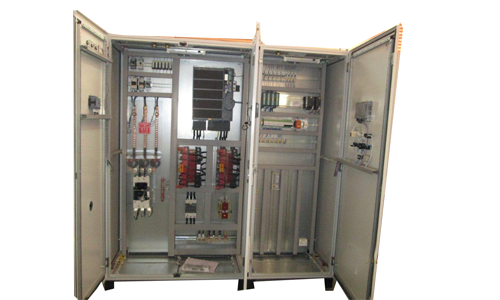 PCC panels are manufactured in a perfectly compartmentalized structure. Premium quality insulators are used to ensure safety. There can be a provision of space heater, thermostat and backup protection if required by customer. APFC Panel has microcontroller based programmable controller which switches the capacitor banks of suitable capacity automatically in multiple stages by directly reading the reactive load (RKVA) which works in the principle of VAR sensing tends to maintain the PF to 0.99 Lag. The capacitor banks may be selected in number of stages as 4/6/8 according to the load pattern. Modern power networks consists of wide variety of electrical and power electronics loads, in case of such varying loads, the power factor also varies as a function of the load requirements .So it is practically difficult to maintain consistent power factor by the use of fixed compensation i.e. fixed capacitors which shall need to be manually switched to suit the variations of the load. It can lead to situations where the installation can have a low power factor leading to higher demand charges and levy of power factor penalties. In addition to not being able to achieve the desired power factor it is also possible that the use of fixed compensation can also result in leading power factor under certain load conditions. This is also unhealthy for the installation as it can result in over voltages, saturation of transformers, maloperation of diesel generating sets, penalties by electricity supply authorities etc. It is therefore necessary to automatically vary, without manual intervention, the compensation to suit the load requirements. This is achieved by using on Automatic Power Factor Correction (APFC) system which can ensure consistently high power factor without any manual intervention. In addition, the occurrence of leading power factor will be prevented.APFC products are fully automatic in operation and can be used to achieve, consistently high power factor under fluctuating load conditions Reduced KVA demand charges, Lower energy consumption in the installation by reducing losses Preventive leading power factor in an installation. Fixing of capacitor at the load end permanently or at the mains. Generally which is recommended for the fixed load like pumps, fans etc. and it is not possible for the load which has variations in the load and PF. We also provide service in cable laying services. We offer install, testing and commissioning of HT & LT cables in trenches, trays and pipes. Cable laying services in industrial complexes, or over large distances, they are staffed by our expert technicians and engineers who perform cable preparation, jointing, termination, testing, commissioning, maintenance and troubleshooting tasks. Cable laying services differ in terms of capabilities like may require cable laying services for low voltage (LV), medium voltage (MV) or higher voltage (HV) cables up to 33 KV. LT Panel is an electrical distribution board that receives power from generator or transformer and distributes the same to various electronic devices and distribution boards. Such panels are used in industries both for internal and external use and, therefore, they are quite rugged to withstand different climatic conditions. HT Panel is like LT Panel except that it is used for high tension cables.